President Reagan called the U.S. Food for Peace program an “instrument of American compassion.” This government program has a tradition of feeding the world’s hungry. It saves lives. It represents the very best of America. And we see it in action again with the recent Food for Peace donation of $64 million to the charity Catholic Relief Services (CRS). The food will be used as part of a relief mission to drought-stricken Ethiopia. Ethiopia is suffering food shortages from failed crops. For the food that is available, prices are high for many Ethiopian families. Catholic Relief Services is feeding about a million people there as part of the Joint Emergency Operations Plan. The Food for Peace donation goes to this joint mission. The charities CARE, Save the Children US, Save the Children UK, World Vision, Food for the Hungry Ethiopia, and the Relief Society of Tigray will assist in the distribution of the food. Around a million people are being given a lifeline, thanks to Food for Peace, CRS and the other charities working together. In addition, CRS and other aid agencies continue their work to build up the resilience of farmers to drought. This effort has helped make Ethiopia less vulnerable to the drought, compared to parts of Somalia where aid agencies have had far less access in recent years. Food for Peace, which started during the Eisenhower administration, has come under pressure recently from Congress. Members of the House of Representatives have proposed cutting most, if not all, of the funding for Food for Peace. Yet hunger-fighting programs are a very tiny part of the overall budget and cutting them makes no dent in the federal deficit. CRS is working with its partners throughout East Africa to bring relief from the massive drought that struck the region. This includes aid to Somali refugees in Kenya, as well as support to host communities there which are also suffering from the widespread drought. In Somalia, within the areas of Mogadishu and Baidoa, CRS is helping 28,000 displaced persons with health and nutrition services. In addition CRS is providing food, water, and livelihood support to 35,000 drought-affected Somalis in the south-central part of the country. Their work involves not only emergency aid, but also projects for building up resistance to future droughts. Article first published as Food for Peace, CRS Working to Feed the Hungry in East Africa on Blogcritics. When hunger ravaged Europe after World War II how did Americans respond? They started a Friendship Train to feed the hungry and help win the peace after the war. Let’s start a New Friendship Train today to reach the hungry overseas starting first with East Africa which is suffering from famine and a severe drought. Then the train will move to provide relief to drought afflicted Afghanistan. Yemen, Haiti, the Ivory Coast and many other countries also need support. First Destination: East Africa…To Feed the Hungry and Malnourished….. Train images courtesy of Shortlines of Chicago Historical Society. Crossing lights image courtesy of Amazing Animations. During 2009 the global hunger crisis escalated with the number of people suffering from hunger climbing over one billion. This great humanitarian crisis calls for action on the part of world leaders. In countries like Afghanistan, Yemen, Iraq, Pakistan, Somalia and Sudan hunger threatens hopes for peace. 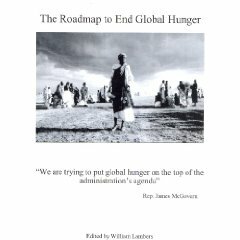 This book includes press releases, interviews and perspective on The Roadmap to End Global Hunger legislation in Congress. This bill (H.R. 2817) was introduced during 2009 by U.S. Representatives Jim McGovern (D-Mass.) and Jo Ann Emerson (R-Mo.). The legislation is based on the recommendations made by groups such as Save the Children, Catholic Relief Services, Mercy Corps, Friends of the World Food Program, World Vision and others. Inside you will hear from offiicials from these organizations as they discuss the Roadmap and its importance in fighting hunger. Also you will see how you can get involved to support the Roadmap to End Global Hunger. Also included in the book is a special historical perspective section on Fighting Hunger and World War II. 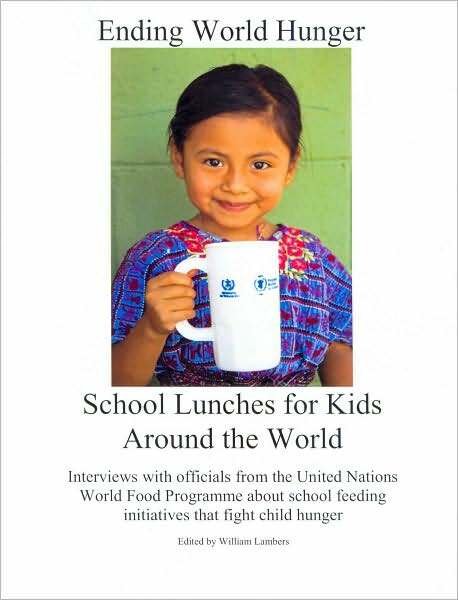 The book Ending World Hunger: School Lunches for Kids Around the World features over 50 interviews with officials from the United Nations World Food Programme, Catholic Relief Services, World Vision, the Barefoot Foundation and ChildsLife International. Each interview shows the status of these critical child feeding programs and the potential for expanding them to achieve universal school feeding. The interviews also focus on the impact school meals have for children in developing countries as well as how people can help these programs. Some of the countries profiled are Afghanistan, Sudan, Colombia, Somalia and Pakistan. The interviews published in the book originally appeared online at Blogcritics magazine. The interviews were arranged by William Lambers in conjunction with the UN World Food Programme office in Washington DC. View the short film Ending Child Hunger: School Lunches for Kids Around the World from William Lambers on Vimeo. Mindy Mizell of World Vision is traveling through the Horn of Africa to report on the relief efforts for famine and drought victims. Amid so much chaos and horror Mizell finds rays of hope, such as 13-year-old Abdillahi, a Somali refugee living in Dadaab, Kenya. His family was forced to flee Somalia to find food and escape the violence. Here is a child confronted with war and famine and Mizell said he never uttered a single complaint or talked about how unfortunate he was. Instead, he remained positive and upbeat. Young Abdillahi just pointed the way to what can end hunger and build peace in the Horn of Africa: education and food. In responding to the drought in East Africa, it’s vital to ensure that all children can receive school meals and an education. This is extremely challenging, especially in areas where there are refugees and host communities all with great needs. This is similar to what the U.S. Army did after World War II. For example, in Vienna, Austria, the U.S. military government helped reopen schools and start a feeding program. They did not want children roaming the streets, and giving them food at school was a top priority with post-war malnutrition rates climbing. The Army and food ambassador Herbert Hoover recognized the such programs were critical and needed to be strengthened and expanded. School feeding provided by the Allies and others after the war was a key defense, as famine threatened to attack many nations at that time. Aid agencies are mobilizing to help children through this crisis and open the door to a better life in the future. But will there be enough funding? Fighting hunger and building children’s education is an area of neglect in the foreign policy of many governments. How do you change this? It’s up to the public to tell their representatives in government that it should be a top priority for all children to receive school meals and an education. That is what can make a difference in the long term for children in East Africa and elsewhere who just want to go to school again. See videos from the World Food Programme’s WeFeedback page. Article first published as Somali Child: I Just Want to Go to School Again on Blogcritics.